With the start of the new year comes new resolutions and goals. Although adults typically come up with their own resolutions the first week of the new year, it doesn’t mean you can’t include your child(ren). Resolutions naturally surround improvements to your physical, mental/emotional and/or social health; however, they can also be used for improvements your child wants to accomplish themselves. During or after the new year are great times to set aside one day dedicated to composing your resolutions. Here are a few ways you can get creative and have fun with your child when creating their resolutions. Put together a tactile vision board composed of various things your child wants to accomplish in the next year. You can use tactile shapes, craft supplies, or household items that your child can connect to or create as a specific goal. Have your child come up with a story about any character they could see as themselves and what they want to do throughout the year. Get creative with a New Year’s resolution mad lib. 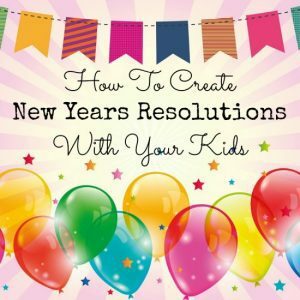 You can create your own or find a printable New Year’s Resolution mad lib your child can fill in with their ideas and goals. Make some creative resolution crafts. Use cut out outlines of only your child’s or your entire family’s hands and overlap them to make a wreath with everyone’s resolution in the center of each hand. Have your child write, type or braille their resolutions on strips of paper, separate them, and put them inside a balloon. At the end of the year, deflate the balloon and see if they accomplished their resolutions. Allow your child to create a drawing incorporating their resolutions. Don’t be afraid to step outside the box and include your child(ren) when creating New Year’s resolutions. Remember: you can always make it fun!